Category: Select a category from dropdown to only show products from the selected category. 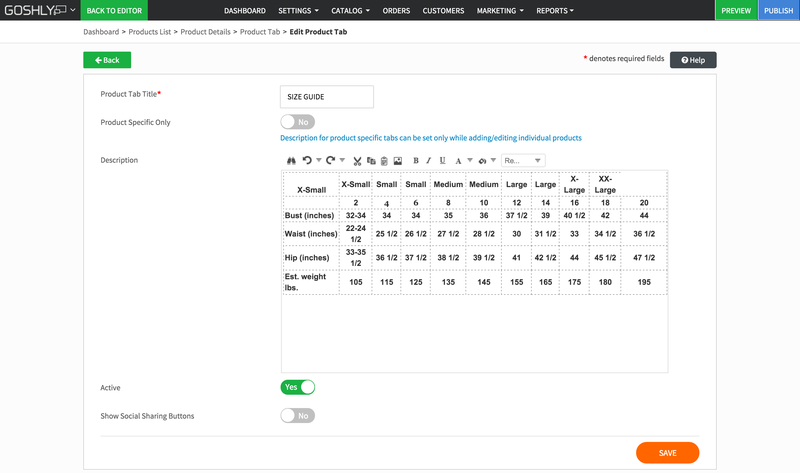 Filter: Use options in the dropdown, including Featured Products and Best Selling Products, to only show items matching the filter criteria. Delete: Delete an individual product or use checkboxes to delete multiple at once. Name: Displays product names. Click on a product name to edit product details. Short Description: Displays short description for each product. Part Number: Displays part number for each product. Stock: Displays the number of products available in your inventory. Price: Displays item price for each product. Retail Price: Displays retail price set in product details for each item. Preview: Allows to preview the product in your store. Copy: Allows to create a copy of the product. Category: Select a category for the product and use an arrow button to add it to the product. Brief Description: Enter a brief description for the product. Long Description: Enter a long description for the product (may include images). Part Number: Enter part number for the product (visible to admins only). Price: Enter unit price for the product. Text displayed before price: Optionally change the default 'Our Price' to a custom text to display before price. Retail Price: Enter a retail price of the product. Toggle Yes to make the product part of subscription model. 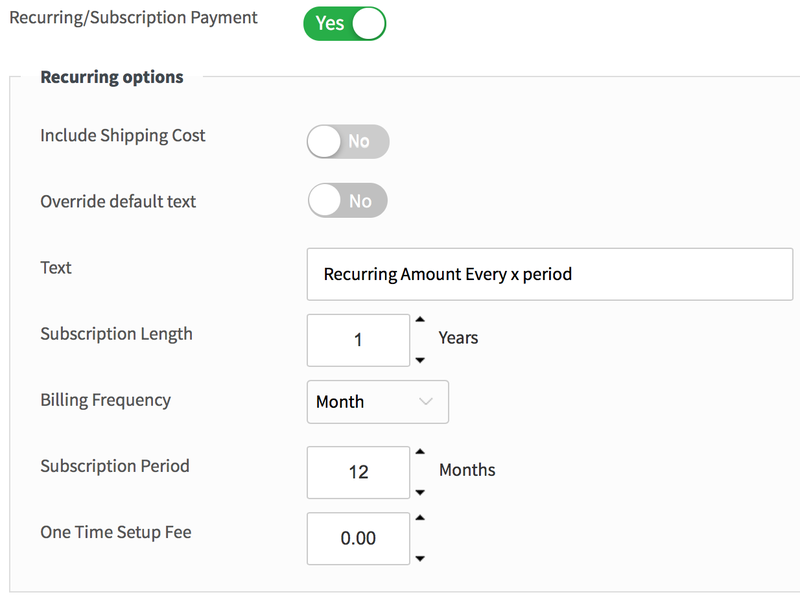 Include Shipping Cost: Toggle Yes to include shipping cost in the subscription price. Override default text: Toggle Yes to override the default text. Text: Enter the text to display. Subscription Length: Enter the number of years for subscription length. Billing Frequency: Choose how frequently to bill subscription customers for the product (daily, weekly, monthly, or yearly). Subscription Period: Enter the number of months for subscription period. One Time Setup Fee: Enter the amount for the one time setup fee, if any. Tax Setting: Choose a tax setting from the dropdown for the product. 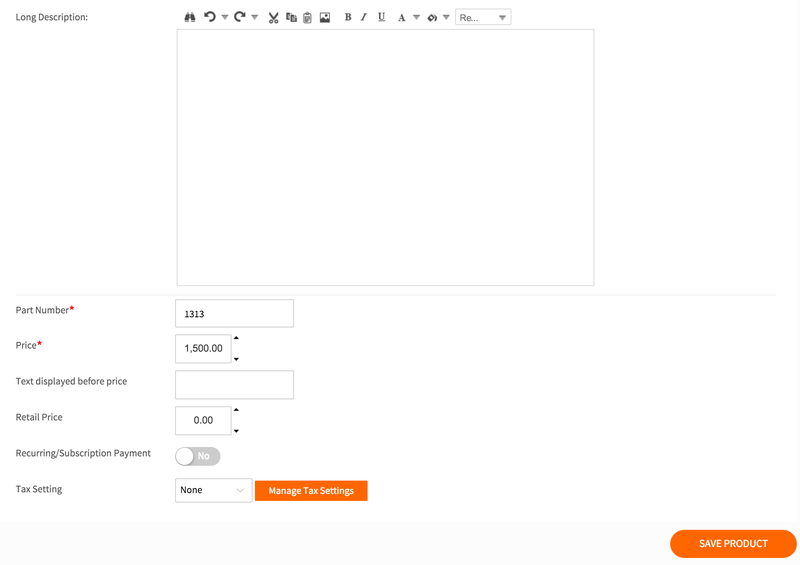 You can manage your store's tax settings by clicking Manage Tax Settings button. Model Number: Enter Model Number, if necessary (internal use only). Weight: Enter product weight (will be used for shipping purposes). You can set global setting for using either KG or LB under Store Settings. Brand: Enter brand name (will be shown as a search filter). Manufacturer Part Number: Add MFG part # (internal use only). UPC Code: Enter product's UPC code (internal use only). Search Keywords: Enter keywords (up to 10 words, separated by comma), to help your customer searching for this product. Featured Product: Toggle Yes to include the product in the featured products section (if added to the website). Best Selling Product: Toggle Yes to include the product in the best selling products section (if added to the website). Downloadable Product: Toggle Yes if this is a digital/downloadable product. When customers pay for such a product, they will be directed to the product download page. Inventory Control: Toggle Yes if you want to designate how much inventory available for this product. Once the inventory is 0, the product will show as Out of Stock. Product Reviews: Enter the number of stars to use in this product's reviews. Product Tag: Pick a tag (shown in the corner of the product listing box, i.e. Sale) or create a custom one. 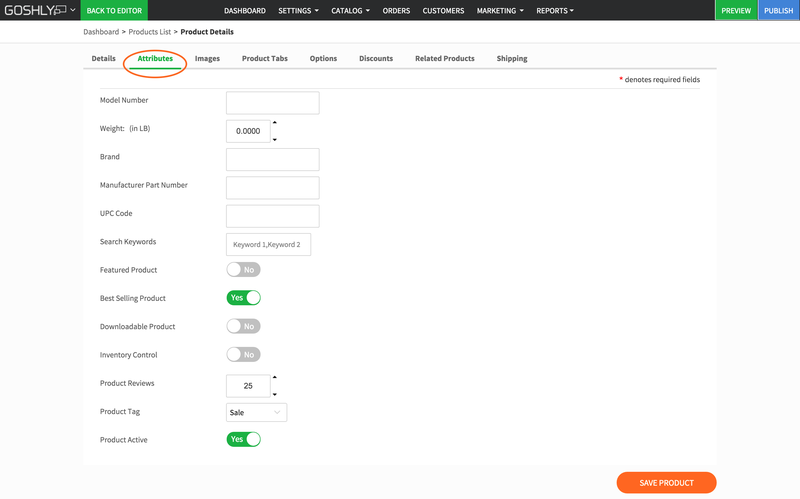 Product Active: Toggle Yes to show the product in your Store Catalog. 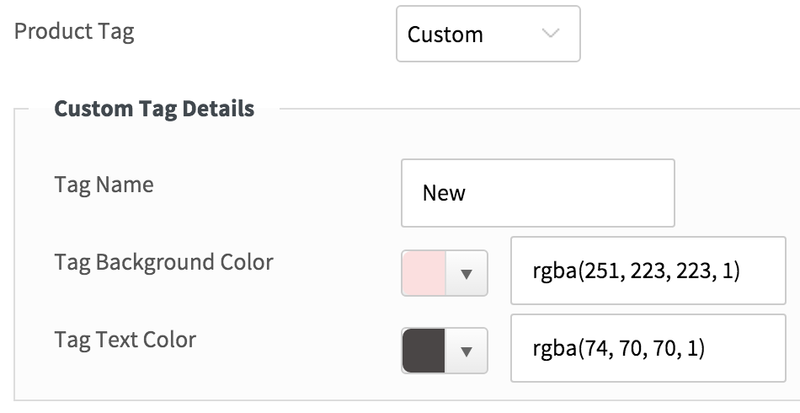 NOTE: If the product will have Swatch Color Options, then go to Options tab to upload images. Upload largest product images possible, they will be downsized automatically. - Portrait: width - 733px, height - 1100px. - Landscape: width - 1100px, height - 733px. Drag & Drop images or browser and choose files. Choose the image to use as the main image for the product and click Set as Primary. If you'd like to have a 3D view of the product, upload the 360 degree product photos under Images 360 View tab. You can view all tabs applied to the product, and add/edit product-specific tab descriptions on this page. Open First Tab on Default: Toggle Yes to have first tab opening on default. Tab Description: Enter product-specific (if any) tab description here. Click to edit existing tabs or create new ones. Add Tab: Click Add Tab button to add a new tab. Delete: Delete an individual tab or use checkboxes to delete multiple at once. Product Description and Review tabs are part of the store layout and cannot be deleted. Tab ID: Displays ID for each tab. Tab Name: Display name of each tab. Tab Order: Displays tab order as they will appear in the store. Active: Toggle Yes to make tabs active. Product Specific: Toggle Yes to make tabs specific to the product. Move Up/Down: Use arrows to rearrange tab order. Edit: Click Edit to make change to tabs. Click Add Tab button to add a new tab or Edit button to edit an existing tab. Product Tab Title: Enter the title for the tab. Product Specific Only: Toggle Yes if the tab only applies to the product that is being edited. Description: Enter tab description. NOTE: for product specific tabs description can be created while adding/editing individual products. Active: Toggle Yes to make tab active. Show Social Share Buttons: Toggle Yes to enable social share buttons on the tab. Option: Check off boxes add desired product options to the product, if any. Click to manage product options. 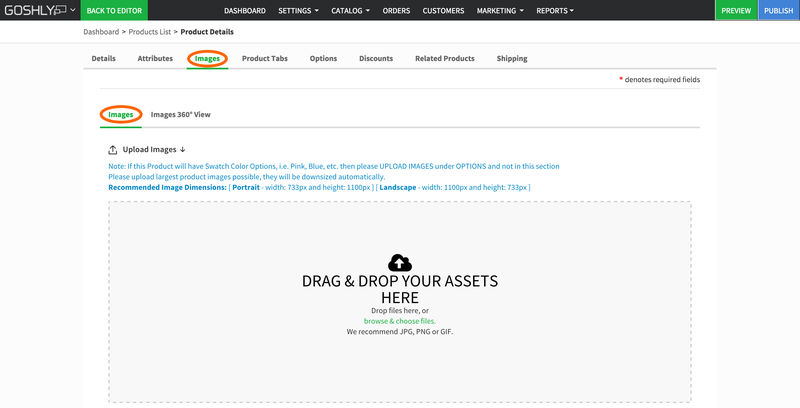 Preview Image (Dropdown Type Only): Check the box to enable preview images for the product option. Preview Images: For the product tabs with enabled Preview Image option, click on the Preview Images button to upload the images for the option. Select a quantity discount and coupons to work with the product. Click to add or edit your quantity discounts. Click to add or edit your coupons. Search Products to Add: Find products to add as related products by searching by part # or product name. Check off the products you'd like to add in the search results, and click Add. Related Products: Added related products are displayed in the table. Use the trash can icon to delete product(s) from featured products. Requires Shipping: Toggle Yes if the product requires shipping (not a digital product). Shipping Method: Toggle Yes to offer existing shipping methods and define shipping cost. Add New Shipping Method: Click the button to add/edit shipping methods.